Kalamazoo, Michigan (USA) -- Growing up in Mattawan, Sean Jones was known for his hockey skills and playing electric guitar in an alternative rock band. Today, he's a Buddhist lama in a Chicago suburb. << Sean Jones is now a Buddhist monk in Cicero, Ill. The transition from Mattawan lad to Cicero lama started in 1994, when the Dalai Lama visited the University of Michigan, where Jones was a college freshman majoring in anthropology and religion. Jones was struck by the Dalai Lama's charisma and compassion, as well as the tenets of Buddism. "(The Dalai Lama) inspired me to search for wisdom within myself rather than looking outwardly," said Jones, who graduated from Mattawan High School in 1993. "He made me think about the importance of compassion and listening to my heart instead of focusing on material success." Jones realized, he said, that Buddhism "wasn't just a bunch of things to believe in. The Buddha himself said to test it out for yourself (rather than believe everything he said)." He joined a Buddhist center in Ann Arbor and continued to practice the lifestyle after moving to Chicago in 2000. Then nearly 10 years after seeing the Dalai Lama, Jones quit his job as in hospital administration and spent three years in virtual isolation at the Buddhist retreat center in upstate New York. 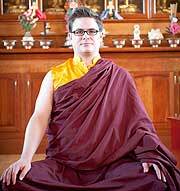 In 2009, Jones became a Tibetan Buddhist lama and is now director of a Buddhist center in Cicero. "(Being the director) is a responsibility and people can usually handle it for two or three years at a time — and I was nominated," Jones said. He described being the director of the temple as the business aspect of running a spiritual center, and being the lama as the spiritual aspect. The lama takes care of the programming and the curriculum at the Buddhist center, including meditation instruction. "I'd hope not to have to be the director (for too long)," Jones said. He said he would rather take care of the spiritual side of running the temple, helping people learn Buddhist teachings, rather than paying the bills. Center Attendant Mickey Johnson has known Jones since 2000. "With Sean, there's no ploy for power; he's just very humble," Johnson said. "He tries to facilitate practices at the center, but he'd never consider himself a teacher. "I doubt you'd find anyone with anything negative to say about him. He's a real likable guy," Johnson said. Growing up, Sean Jones was a smart, curious child, says his father, Clarence Jones. Sean Jones said he played hockey from kindergarten through his senior year of high school. He said he stopped playing when he started college because he didn't want to play on the men's league in Ann Arbor. He also played an electric guitar in an alternative rock band called Leather Elephant in high school. They used to play shows in the Kalamazoo area, including Harvey's on the Mall and all-ages shows at the former Whole Arts Theatre. But there also was a hint that Jones was not a typical teenager. "When Sean was in the 11th grade, we (my wife and I) bought him all new clothes for Christmas. He took them all back and bought used clothes at Goodwill," Clarence Jones said, laughing at the memory. After graduating from Michigan, Jones moved to Chicago and found a job as an administrative assistant in the anesthesiology department at Northwestern Memorial Hospital. But he left that job for a three-year stay at the Karme Ling Retreat Center in Delhi, N.Y.
"I never really thought I would actually do the retreat," Jones said. But, he added, "When you make a commitment to something, especially something you believe in strongly, no matter how difficult it is, it is important to see it through." His father, Clarence, said he was surprised when his son told him that he was going to spend three years at the retreat. "I couldn't understand why (he chose to go to the Buddhist retreat), because I know nothing about Buddhism," Clarence Jones said. "I was shocked." Jones' 32-year-old brother Matt said his sibling is very dedicated to his spiritual growth. "I couldn't do it. You have to be really dedicated (in order to make it through the retreat)," Matt said. Jones started the retreat process by enrolling in a two-month program to help him and 10 other Buddhist students adjust daily schedules to resemble the one they'd have to follow for the next three years. They had to wake up earlier and get less sleep than they were used to in order to prepare to wake up at 4 a.m. and go to bed at 10 every night at the retreat, he said. "You definitely feel confined," Jones said. "The moment they closed the gate, it started to snow and you would definitely feel like you weren't going anywhere." During his 1,000-day stay, Jones had only 10 other Buddhist students and teachers for company. They had no access to telephones or the Internet to keep in contact with friends and family; the only method of communication allowed was writing letters back and forth to people outside the retreat. "(Visiting my son at the temple) was scary," Clarence said, describing the building as being surrounded by 20-foot-tall walls, "so, it's like he's locked in." Jones came back to Chicago soon after leaving the retreat in 2008 and was able to get his job back. His family said the retreat didn't change him. "It's weird; I had a feeling that when he came back form the retreat, he would be the same," Matt said. After he returned to Chicago, he became the lama and director of the Karma Thegsum Choling Buddhist temple in Cicero, Ill.
His teacher from the retreat asked him to join the center after their resident lamas left for other states. "He wanted me to share what I had the opportunity to learn and put into practice. I hope I am able to do that in some small way," Jones said. Although a lama is usually considered a teacher in Tibetan Buddhist tradition, Jones said he doesn't consider himself to be one. "Connecting people who are interested with the great masters of this lineage (the Tibetan Buddhist Kagyu Lineage) is important to me. I never portray myself as a teacher or anything special. I'm just trying to share the wonderful gifts that Buddhism and this lineage has given to me," Jones said. "I'm a professional student forever because I'm always learning." The Kagyu Lineage is one of four Tibetan Buddhist lineages. The others are the Nyingma Lineage, the Sakya Lineage and the Gelug Lineage. Jones spends time with new members at the Buddhist center to help them learn about the teachings and rituals. He also remains open to other faith traditions. Proving that, he was recently married — in a Catholic wedding. They've already gotten a Buddhist blessing. Even though his son has been a Buddhist for many years now, the traditions still seem confusing to Clarence Jones, although he recognizes that his son has achieved a distinguished position. "They bow down and kiss his hand," Clarence said about the Buddhists at the Cicero temple. "Whatever his position is, they look at it as something great."